I wanted to follow up briefly on my earlier post regarding the "Wamapoke Tribe" as depicted in the television show Parks and Rec. Of particular interest is the actor Jonathan Joss's character, "Ken Hotate," who plays a tribal leader of the Wamapoke. In general, the show does a better-than-average job of engaging with the often absent voices of Native people who lay claim to this fictional geography, and despite the fictive nature of the setting, the issues brought up are nevertheless important and have stark parallels to many if not most populated areas within the United States. Rather than simply ignoring the "problem" of contemporaneous Native presence, the show somewhat sheepishly (and humorously) acknowledges not only the horrific actions of the town's settlers in their interactions with the Wamapoke, but also the reality of the economic, political, and physical presence of the tribe as neighbors and important actors within the world of the show. Before Parks and Rec, Joss voiced the character "John Redcorn" in King of the Hill. This Native character was initially known primarily for the occasional gag about new-age practices or lascivious behavior, however, as Joss notes in an interview with Indian Country Today in 2013, he petitioned the writers to expand this one-dimensional character into something more dynamic. They liked the idea of him being a running joke, a good laugh of climbing in and out of the window. After a while of doing that, I felt they were wasting a good character that could have an arc and tell a story other than being a one-punch joke. I pitched ideas to the writers...It was all about coming from a good place and trying to make Redcorn a better character. Clearly Joss thinks critically about how his representation of Native characters influences a broader sense of how Native people are perceived. 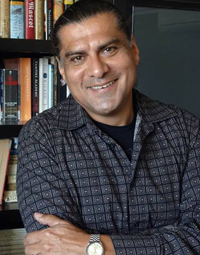 In a talk at Our Lady of the Lake University, he notes that he enjoyed the part so much because it "changed the way people look at Native Americans," going on to express excitement for the potential of his "goof ball" character (Hotate) in Parks and Rec to continue to break representational expectations of Native people in popular culture. Hank Hill, left, Johnny Redcorn, right. But you knew that already, didn't you? To that end, his portrayal of Hotate was of particular distinction to him. Joss's character would be "an Indian in a suit," his first acting role with this distinction in his 20-year career. Behind the scenes, Hotate also noted that Parks and Rec was careful to not give Joss actual sacred/traditional medicines. In scenes where he is conducting "ceremonies," the herbs and plants used are "sugar and spice and everything nice" but not actual sage or tobacco. Joss's portrayal of Hotate keeps him from the stereotypes of breech-cloth and horseback or eagle feather and corn pollen, however it does so slyly; as a businessman as well as tribal leader, the character Hotate is often involved in political or business discussions with the town. In these instances, he is aware of the limited stereotype of Native Americans the town possesses and uses this knowledge as a means of furthering his or the tribe's interest. In one such story arc, it is found out that the town's fall festival is taking place on a historical massacre site. In negotiations with Leslie Knope (Amy Poehler), Hotate argues that holding a festival with "shooting galleries and fried dough stands" was incredibly inappropriate. Nevertheless, after exhausting more formal arguments, the Knope still intends to hold the festival on the massacre site. As a last effort, Hotate "curses" the town's fall festival, noting in a cutaway that there are two things he knows about white people: "they love Rachel Ray and they are terrified of curses." The force of this "curse" relies on cultural expectations and stereotypes about Native people, and while it carries no actual threat (Hotate clearly finds the entire exercise laughable), it nevertheless begins to take on a critical valence within the episode as any and all difficulties related to the festival are beginning to be attributed to the curse. After using this suasion to negotiate the Wamapoke History Exhibit inside the carnival grounds and right inside the entrance, Hotate revokes the "curse" by giving a mock-ceremonial prayer in the Wamapoke language, translated in subtitle for the viewer: "I am not saying anything. No one can understand me anyway. Doobee. Doobee. Do." This playful use of the townspeople's expectations is one of the scenes that Joss had some concerns about. He worried that they would be misinterpreted by Native communities or other concerned parties as disrespectful, however it seems to me that these scenes are the ones that highlight the dynamic ways in which the character plays off of multiple representational expectations from the townspeople, the town government, and, critically, the viewer. Even while the program lampoons and criticizes the absurdity of these ignorant stereotypes, Hotate is shown deftly and pragmatically playing with these expectations to his and his tribe's benefit. Jonathan Joss as Ken Hotate. Bonus: the man in the photo in the background is the Hidatsa chief Crow-Flies-High, leader of the Hushgah band of Hidatsa and Mandan. My grandpa wrote about this in his MA thesis. I've been thinking through how the fictional "Wamapoke" tribe is represented and written into the television show Parks and Rec. Specifically the character "Ken Hotate," played by indigenous actor Jonathan Joss (also known for voicing "John Redcorn" in the animated show King of the Hill), actually utilizes and plays with the expectations and stereotypes of the people of Pawnee. Hotate "plays" at being Indian insofar as he performs the stereotypical indigenous identity for the townspeople, but this is usually after a much more typical conversation between Hotate as a political and business leader and the government of Pawnee. His use of stereotype as a method of suasion and influence to get what he wants from his negotiations is an interesting study in undermining stereotype though awareness and active agency. I want to look a bit into Joss's thoughts on the show. From what I've read, he was quite happy with how the character was written. He made specific choices about Hotate's costume design, leaning towards a more "modern" suit and general appearance in the show. I'm also going to see if there is any discussion with the writers and the choices being made around Hotate's character/representation with the show. I'll dig into it a bit in the coming days. Hopefully more on this topic soon.